Followers of both our Twitter and Facebook pages know this is a regular, weekly feature. But this is one of those Warrior Wednesday photos that needs to be shared with the site’s regular readers, who may just remember the story behind it…and enjoy it all over again! It all started on June 17th, when CDR Zeigler’s wife, Déna sent an email to the website to thank Ben for making her sons’ first day at his football camp such a thrill. She mentioned in her email, which was posted to the website, that her husband was currently deployed to Afghanistan and this camp was a gift from him to their boys. While reading the comments posted to his website that evening, Ben saw Déna’s and the next day called both of her sons out of the large group of campers to throw each of them a pass. As it turned out, one of the boys was celebrating a birthday that same day – Steven, shown at left in a victorious moment with Ben after catching his pass! Neither did their dad! But he was able to see the excitement for himself later that night when his wife posted a video from camp online for him to watch! “My boys had a great time today at camp! My youngest getting to ask Ben a question and my oldest son Andrew catching a 50 yard bomb over the outside shoulder made for lifelong memories. I wish I was there to see it in person, but through the wonders of YouTube, I was able to watch it from Afghanistan. I hope Paul Chryst and Todd Haley were watching! Thank you to Ben, Ben’s family, and all those who work so hard to put on the camp. You made two, no 500+, kid’s day! My wife and I are touched, almost to tears, by the gesture. Here We Go Steelers, Here We Go…and Go Big Ben!” – CDR Mark Ziegler, SC,USN; to the website’s Facebook page that evening. You can read more from their spectacular day here. 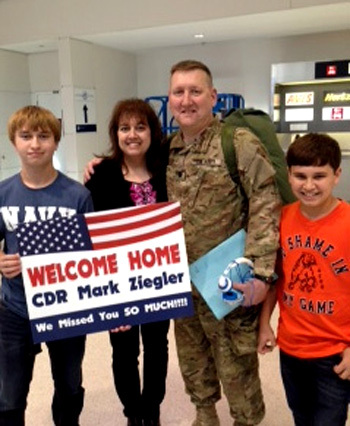 CDR Ziegler just completed a six month deployment in Kabul, Afghanistan and is happy to be back home with his family in Stafford, VA. Thank you for your service sir, and God bless!